The 15 day Iceland and Greenland Transatlantic cruise on the Star Princess is one of the most interesting and unique cruises we have experienced. From the Medieval city of Copenhagen to the iconic white cliffs of Dover, to the lush green beauty of Ireland and Scotland, to the volcanic wonders of Iceland, to the iceberg surrounded coasts of Greenland, to the scenic allure of Newfoundland, to the hectic New York metropolis, this cruise is a cornucopia of eclectic cultural experiences. The Star Princess is a beautifully designed ship that holds almost 2600 passengers and features a Piazza-styled atrium, multiple swimming pools and hot tubs, The Sanctuary adults-only relaxation area, and Movies Under The Stars. Several passengers told us that the Star Princess was their favorite ship of any they have cruised. The Star Princess has a certain charm in that it is neither too big nor too small. There are more than enough conveniences to enjoy without the crowded feeling one can have on the mega ships. Our cruise began in the beautiful city of Copenhagen, Denmark. Dating back to the 1100's, Copenhagen is filled with graceful canals that are lined with some of the most beautiful architecture in Northern Europe. The statue of Hans Christian Andersen’s Little Mermaid is a must-see. Tivoli Gardens, which is known as one of Europe’s most celebrated gardens, is another sight you won't want to miss. Amalienborg Square is a great place to stroll past the many quaint shops offering tempting local delicacies. There is so much to see and do in Copenhagen (Kings New Square, Tivoli Gardens, the Little Mermaid Statue, Rosenberg Castle and Church of Our Lady, the final resting place of Hans Christian Anderson that you might want to arrive a day or two before boarding the ship. Most of the cruise lines use the new Freeport Cruise Terminal which is in an industrial harbor area north of the center of Copenhagen. The other is Langelinie (referred to as the Copenhagen Cruise Terminal), just around the corner from the world famous Little Mermaid statue about two miles from downtown Copenhagen. Walking to and from the city center from the Freeport Cruise Terminal takes about an hour. Shuttle buses and taxis take about 20 minutes. Princess tours in Copenhagen include - Copenhagen City Drive & Dragoer Fishing Village, Hamlet's & Frederiksborg Castles and North Sealand Country & Frederiksborg Castle. On this particular cruise, we chose to tour Leeds Castle and the legendary cathedral town of Canterbury. Leeds Castle, built on small islands in a lake, has a very “fairy tale” look and feel. It is visited by over 500,000 tourists a year. The castle houses an aviary, a grotto, a golf course, and a maze consisting of more than 2000 yew trees. There are many spectacular and unusual things to see and do on Leeds Castle’s 500 acres including The World’s Smallest Museum - The Dog Collar Museum. Princess tours offered in Dover include -Tower of London, Covent Garden & Harrods, Westminster Abbey, London Eye & Thames River Cruise. Falmouth, England, home to the third largest, deep water harbor in the world, has a great history of shipwreaks, smuggling and privateering. Falmouth tourist attractions include the town's 17th century harbor and boat yards, the National Seal Sanctuary - a local rescue centre for local seals, sea lions and otters, and Pendennis Castle - the largest castle in Cornwall which dates to the mid 1500's. Be sure to allow yourself enough time to try Falmouth's famous Cornish Cream Tea and scones. Princess tours in Falmouth include - Falmouth, England - Lanhydrock House & Fowey, Land's End Peninsula Complex & Scenic Drive, Lizard Peninsula Walk & Pub Lunch. Waterford is famous for its had-cut crystal but the town also has a rich history. Viking Towers, prehistoric barrows and castle ruins can be found throughout the surrounding countryside. We chose to tour some of the city's historic sites and then visit the famous Waterford Crystal factory. We were treated to a very interesting tour where we learned how the world-famous Waterford Crystal has been hand-produced since 1783. Princess tours in Waterford include - House of Waterford Crystal & Kilkenny Castle, Rural Ireland & Jerpoint Abbey, City Drive & House of Waterford Crystal. Greenock, Scotland is situated at the mouth of the River Clyde in the picturesque area of Inverclyde. It is famous for its Victorian architecture. We chose to take a bus to Glasgow - the commercial and cultural capital of the Lowlands. On our tour of Glasgow we explored the city and its shops, art galleries and parks. We visited Cathedral Square - one of Glasgow’s priceless historical sites and the highlight of our tour. The Glasgow Cathedral, constructed in 1136, is the only cathedral in Scotland to have survived the reformation intact. We also enjoyed touring the grounds surrounding the University of Glasgow - the fourth oldest university in the English speaking world (1451). Princess tours offered in Greenorck include Inveraray Castle & Loch Lomond, Edinburgh Castle, Royal Mile & Princes Street, Culzean Castle & Ayr. Belfast is the capital of Northern Ireland. Though it was once a very dangerous place to visit, Belfast has experienced a renaissance since the 1994 cease-fire ended the violence between Catholics and Protestants. Belfast is famous for its ship building prowess. The legendary and tragic RMS Titanic was built here. Today, a huge Titanic Memorial Statue stands on the City Hall grounds. Belfast's Cathedral Quarter, with its cobbled streets, is home to St. Anne's Cathedral - an impressive example of the Hiberno-Romanesque architecture. Free tours are offered at the beautiful and historic Belfast City Hall and we highly recommend that you take one. Before leaving Belfast, be sure to stop at the famous Crown Bar for a glass of Guinness. The Crowne Bar has been a Belfast fixture since the late 1800's and features "a lovely burnished primrose yellow, red and gold ceiling, a floor laid in a myriad of mosaic tiles, brocaded walls ubiquitous highly patterned tiles, vigorous wood carvings throughout, ornate mirrors, wooden columns with Corinthian capitals and feathered motifs in gold." Iceland is a land of volcanoes and glaciers, lava fields and green pastures. Geothermal energy is one of Iceland’s greatest natural resources and provides most homes with hot water. The geothermal steam is also used to generate electricity. Reykjavik, the northernmost capital of the world, is said to have been founded in 874 when Ingolfur Arnarson threw wood pillars into the sea vowing to settle where they washed ashore. For our tour we chose The Golden Circle tour. This tour introduced us to the many natural wonders of Iceland. We visited Thingvellir National park, Gullfoss Waterfall, Strokkur Geyser and Hveragerdi. 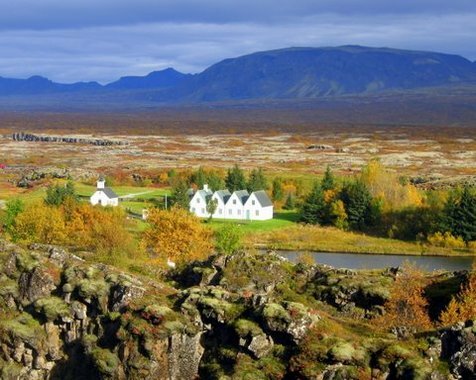 Thingvellir National Park is a geological wonderland which also includes the historic meeting places of the Althing - one of the oldest political assemblies on earth. Princess tours offered in Reykjavik, Iceland include - Super Truck 4X4 Adventure, Swim in the Blue Lagoon, Eyrarbakki, Stokkseyri & Lake Kleifarvatn. We were lucky enough to be sailing away from Iceland when the captain announced that the Northern Lights were visible. Within moments, the inside of the ship emptied and everyone made their way out on deck to experience these wondrous colors glowing in the atmosphere. After a day at sea, most passengers were up on deck early to view the icebergs surrounding Qaqortog. Since Qaqortog is frequently isolated by winter sea ice, it is usually only accessible by airplane or helicopter. The captain announced that he was not sure we could tender in and that it had been four years since tendering was possible there. We were all very excited to hear his next announcement - we were going in! No tours were available in this tiny town of 3400 people. There was only one small gift shop which soon filled up with passengers. The local church presented a singing program for anyone wishing to partake. They entertained us in native costume. The people of this tiny, isolated town of Qaqortog were happy to have tourists visit and tell us about what it’s like to live in their part of the world. Qaqortog and Greenland points of interest include - Vor Frelser Kirke Church of Our Savior, Stone & Man, Hvalsey Church and the Great Greenland factory. Newfoundland is Canada’s most easterly province. St. John’s is the capital. It is thought to be the oldest city in North America. The Downtown St John's tourism board calls St. John's "the City of Legends" and describes it as city as "numerous historical sites, a unique culture, and natural beauty. Home to many of these things, the downtown area provides a mix of the new and the old." Visit their website at http://downtownstjohns.com/discover/attractions/ to see their list of must-see attractions. We enjoyed the Signal Hill and the St. John’s Museum tours we enjoyed. Signal Hill and Cabot Tower offer exhibits about Gugliemo Marconi and wireless communication. This is the location of the first transcontinental wireless radio message in history. Princess tours in St John's include - Puffin Island Adventure By Boat, Quidi Vidi Fishing Village & Port Wine Tasting, Cape Spear Lighthouse, St. John's and Signal Hill. Our cruise ended with an early morning arrival into New York Harbor. The Statue of Liberty seemed to be greeting us as we sailed past her. New York City is one of the most populated metropolitan areas in the world. It is an international center of politics, business, culture and entertainment. Founded in the early 1600's as the Dutch New Amsterdam, it came under British rule in the mid 1600's and was renamed New York. We highly encourage you to add a few days to your post cruise experience and enjoy the sights and sounds of this iconic city. New York highlights include - Times Square, Statue of Liberty/Ellis Island, Empire State Building, Central Park, Chinatown, Wall Street, Brooklyn Bridge, Rockefeller Center, Metropolitan Museum of Art, Staten Island and Staten Island Ferry, Ground Zero/World Trade Center, Grand Central Terminal, St. Patrick's Cathedral, Natural History Museum, United Nations, Broadway Shows and Theatre District, and the Guggenheim Museum. Princess tours of New York City include - Statue of Liberty & Ellis Island, Rockefeller Center, Ground Zero & Battery Park, Lower Manhattan Highlights Scenic Drive and New York Highlights Scenic Drive. The 15 day Iceland and Greenland Transatlantic cruise on the Star Princess is one of the most interesting and unique cruises we have experienced.